An exhortation for our Christian life, in multiple verses including Heb 4:16. We are on the path from the original created earth to the new earth. This involves the reconciliation of all things by the death of Jesus Christ, the freeing of all creation, and the recognition and confession by all that Jesus Christ is Lord, to the glory of God the Father. This glorification points toward New Jerusalem as the ultimate glorification of God. You in the beginning, Lord, laid the foundation of the earth, and the heavens are the works of Your hands; they will perish, but You remain perpetually; and they all will become old like a garment, and like a mantle You will roll them up; like a garment they will also be changed; but You are the same, and Your years will not fail. The book of Hebrews emphasizes the superiority of Christ and His new covenant. Our part is to look away to Him, hold to Him, come forward to Him on the throne, and let His living word operate in us. He must have priority in our lives over everything of the old creation; the old, perishing things are not our focus. 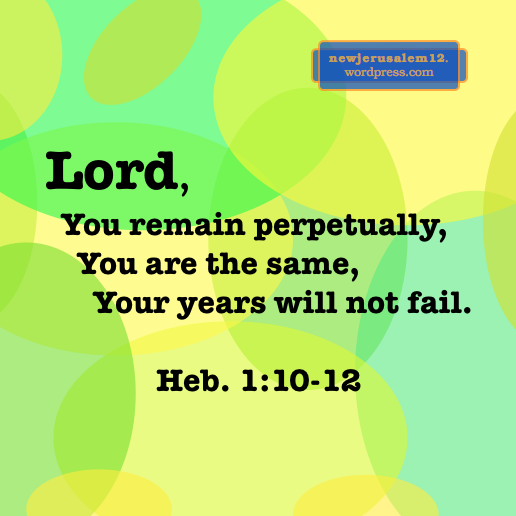 The Lord is perpetual and New Jerusalem will be perpetual by being saturated with Him. Lord, draw us every day to give You first place in our living! New Jerusalem is the eternal holy of holies where we are one with the Triune God, see His face, serve Him, and are enlightened and nourished by Him. New Jerusalem will be wonderful, but don’t wait passively. 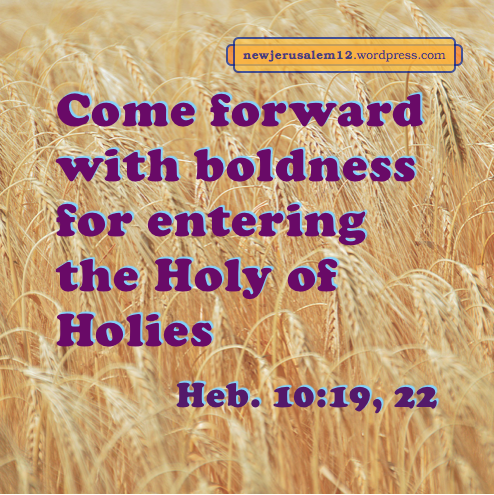 Hebrews 10:19 tells us that we have “boldness for entering the Holy of Holies in the blood of Jesus.” This is for today! Verse 20 continues, “which entrance He initiated for us as a new and living way through the veil, that is, His flesh.” When Jesus died on the cross, the veil in the temple, which separated the holy place and holy of holies, was torn (Mark 15:37-38). This opened the “new and living way” for us to enter the holy of holies. Therefore, verse 22 exhorts us, “come forward to the Holy of Holies with a true heart in full assurance of faith.” Today this real and spiritual holy of holies is in heaven until New Jerusalem “comes down out of heaven from God.” How then can we, who are physically on earth, come forward to and enter this heavenly holy of holies? The answer is Christ! He is the One who joins earth to heaven. He is both in us and in the heavenly holy of holies. In Christ we have the boldness and we have the full assurance of faith. Let us come forward to the present reality of New Jerusalem as the holy of holies. The Old Testament temple is a picture of the reality of the New Testament temple. The Old Testament holy of holies also depicts New Jerusalem as the eternal holy of holies. In that holy of holies was the ark with its contents “and above it [the ark] cherubim of glory overshadowing the propitiation place” (Heb. 9:4-5). Propitiation is the base for the glory. New Jerusalem has both the Lamb as the New Testament propitiatory sacrifice and the glory of God illuminating the city (Rev. 21:23). Romans 3:23 says, “all have sinned and fall short of the glory of God.” Jesus Christ, through His redemption, is the way to be freed from sins and to come up to the level of God’s glory. Both solutions are seen in the propitiation cover with the cherubim of glory. New Jerusalem will declare both eternally. The propitiation place is in the holy of holies. Therefore, this experience of redemption is deeper (more inward) than that of the trespass offering at the altar in the outer court of the temple. Although we might not understand the difference, we should seek to advance in our Christian life. The trespass offering and the propitiation place both take care of our sins, but only the latter is intimately tied to God’s glory. Do not be satisfied to remain in the outer court. New Jerusalem is the holy of holies; there will be no more outer court. Don’t wait; advance now. Lord, I want to have a deeper experience of Your forgiveness. Bring me to the propitiation place so that Your glory may come forth. The verse tells us that God and the Lamb will be on the throne. God on the throne is obvious but for the Lamb, Jesus, the God-man, it is helpful to consider additional verses. Matthew 28:18 “Jesus came and spoke to them, saying, All authority has been given to Me in heaven and on earth.” Jesus, the Lamb, was given all authority in resurrection. This portion tells us that God raised Christ from the dead, exalted Him to the heavens, enthroned Him far above all, subjected all things under Him, and gave Him as Head over all. All these steps are to His Body now and to New Jerusalem in eternity. Let us come forward to the throne now on our way to New Jerusalem. * From footnote 1 on Hebrews 4:16 in NT Recovery Version Online. Till God and man together dwell in one. These four lines speak of the new creation with New Jerusalem as its center (Rev. 21:1-2). There is no more veil, no more camp, and no more separation between God and man because the devil, death, hades, and everything negative have been cast into the lake of fire (Rev. 20:10, 14; 21:8). “Death will be no more, nor will there be sorrow or crying or pain anymore; for the former things have passed away” (Rev. 21:4). We should rejoice for what is coming, but not merely wait for that time. We should enter the veil now. This is to come forward to the holy of holies (Heb. 10:19-22), which is to come forward to the throne of grace (Heb. 4:16), the throne which will be in New Jerusalem (Rev. 22:1). Let us come forward to the throne, within the veil, to the foretaste of New Jerusalem. * from note 1 on Heb. 4:16 in NT Recovery Version Online. The holy of holies described in Exodus is a portrait of New Jerusalem as the eternal holy of holies. 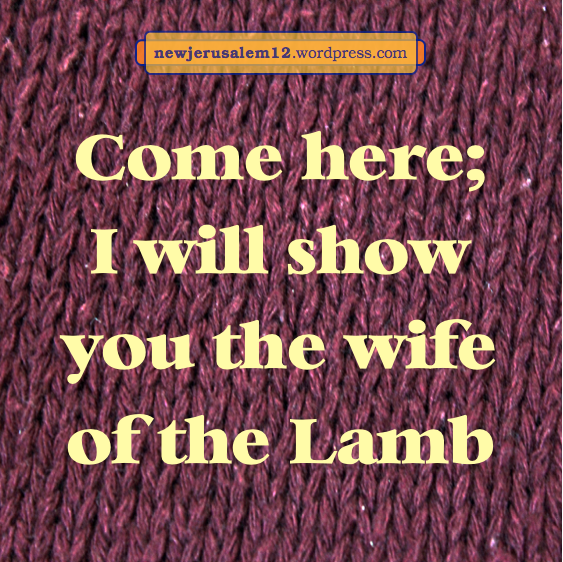 The entrance to the holy of holies was a veil. Hebrews 10:20 tells us is that the veil portrays the flesh of Jesus. Because the veil depicts the flesh of Jesus, it relates to His humanity. The linen is His perfect humanity, with heavenliness (blue), royalty (purple), redemption (scarlet, signifying His shed blood), and glory (cherubim). All of these features are seen in New Jerusalem. The man Jesus is the Lamb of God (John 1:29) who is on the throne in the city (Rev. 22:1); this includes the humanity, royalty, and redemption depicted by the veil. 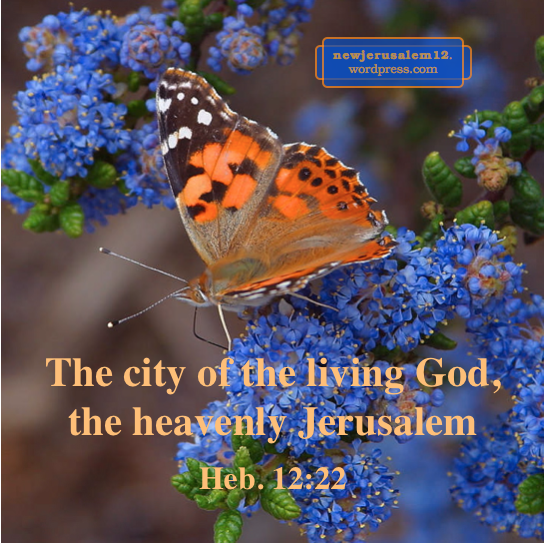 New Jerusalem is heavenly. It comes down out of heaven (Rev. 21:2) but retains the heavenly nature; this too is related to the humanity of Jesus. Also, New Jerusalem has the glory of God (Rev. 21:11). To be brought to God is to be brought into the holy of holies. We have this access by the blood shed in His death (Heb. 10:19-22). Now we come forward to the throne of grace (Heb. 4:16), to Jesus (Heb. 7:25), and to the holy of holies (Heb. 10). The throne, Jesus, the holy of holies, and our coming forward are all for today and for New Jerusalem. Let us come forward with boldness! New Jerusalem, a cube (Rev. 21:16), is the eternal holy of holies. The holy of holies described in Exodus portrays something of New Jerusalem. However, we are not in that age! Hebrew 9:11 has a great turn: “But Christ, having come…”! When Jesus died, “the veil of the temple was split in two from top to bottom” (Matt. 27:51). 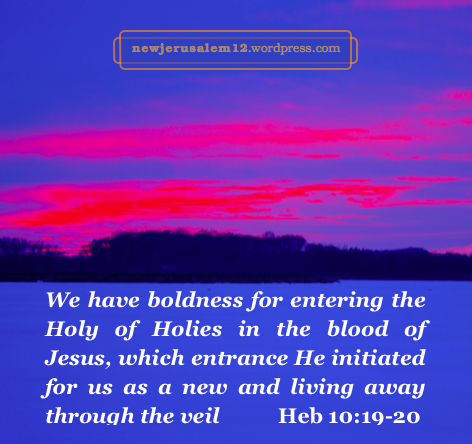 As a result, “Having therefore, brothers, boldness for entering the Holy of Holies in the blood of Jesus, which entrance He initiated for us as a new and living away through the veil, that is, His flesh…” (Heb. 10:19-20). Through the death of Jesus Christ the veil has been rent! We can enter the spiritual holy of holies now and our entrance to New Jerusalem is guaranteed. Having the new and living way, “and having a great Priest over the house of God, let us come forward to the Holy of Holies with a true heart in full assurance of faith” (Heb. 10:21-22a). Although the pictures in Exodus convey something about New Jerusalem to us, they do not show us the way to enter. Thank God that we are in this age, after the death and resurrection of Jesus Christ. We exercise our faith to receive His redemption and thereby have boldness to enter the holy of holies now on our way to New Jerusalem. 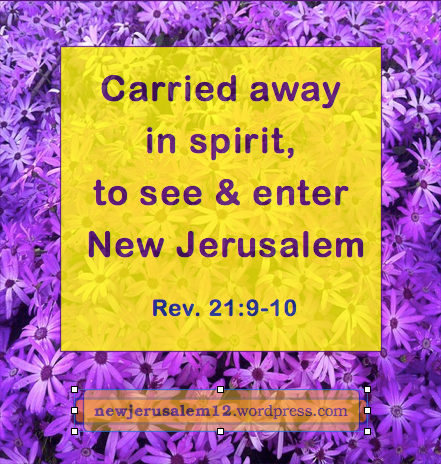 This concludes a series of posts about seeing and entering New Jerusalem. The key is “carried away in spirit onto a great and high mountain” to see this wonderful eternal city (Rev. 21:9-10). Here is a one sentence highlight, a verse reference, and a link for each post. ❖ The consummation of Revelation is New Jerusalem, presented by the Bible in figurative language. We need the Lord to carry us away in spirit to a high mountain to see New Jerusalem (Rev. 21:10-11) and to understand the spiritual significance of all its elements. ❖ In Exodus 24 and 34 Moses was at the top of a mountain, in God’s presence, in glory, and received God’s speaking, including the vision of the tabernacle, a forerunner of New Jerusalem. ❖ Isaiah 52:7 says, “How beautiful on the mountains are the feet of him who brings good news…” All God’s good news, including New Jerusalem as His consummate news, is announced by people “on the mountains” no matter what their physical location. ❖ Israel’s journey to Mt. Sinai portrays our Christian journey to the mountain to see New Jerusalem. The first steps in their journey were redemption, eating the passover lamb and unleavened bread, and crossing the Red Sea. 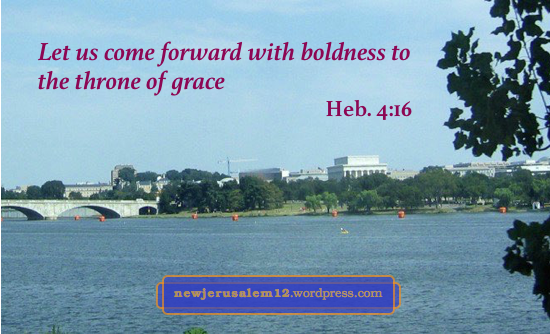 ❖ The next step in Israel’s (and our) journey is to sing and praise the Lord for His victory and His kingdom. This brings us onward to the wonderful experience of the springs of living water. ❖ Eating the manna (a picture of Christ—John 6) daily and drinking the water (a picture of the Spirit—John 7) out of the rock are essential nourishment for our Christian journey. ❖ On our journey we also need to fight against the flesh but not in our own strength. Rather, “Walk by the Spirit and you shall by no means fulfill the lust of the flesh” (Gal. 5:16). ❖ In Exodus 19 to 23 God spoke the ten commandments and many supporting ordinances. All God’s words show our shortages apart from Christ. Nevertheless, “the blood of Jesus His Son cleanses us from every sin” (1 John 1:7). ❖ On our Christian journey we need Jesus Christ as our burnt offering, as the person absolute for God. He is our replacement and we are identified with Him. This is portrayed in Leviticus 1:3-4. ❖ Christ as the burnt offering replaces us by coming into us to live in us and through us. It is by Christ our life and by our walk according to the spirit (Rom. 8:4) that we can see the vision of New Jerusalem. ❖ When Moses went up the mountain he entered into the cloud (which cut off his view of everything earthly) and was there forty days in the glory of the Lord (Exo. 24:15-16, 18). When we give time to the Lord, He will reveal His heart to us. ❖ We journey from death and slavery in the world to a spiritual mountain to see and enter New Jerusalem. For this journey, Christ is our life (Col. 3:4) and we walk in newness of life (Rom. 6:4). ❖ Our seeing of New Jerusalem depends both on the Lord’s mercy and on our cooperation. By the Lord’s mercy, may we let the Spirit dwell in us, live in us, be active in us, so that the Spirit can reveal more to us (Rev. 21:9-10). ❖ On a mountain the Lord spoke the reality of the kingdom of the heavens, which leads to New Jerusalem. In ourselves we cannot reach this level, but we have the life of our heavenly Father (Matt. 5:48). ❖ Everything written in the Old Testament, including Israel’s journey to Mt. Sinai, is for our instruction, admonition, and encouragement (1 Cor. 10:11, Rom. 15:4). Today, our job is to hold Jesus Christ, who is the reality (Col. 2:16-19). ❖ Recent posts have been about seeing New Jerusalem. After we see, how do we enter into the present reality of New Jerusalem? The answer is in John 3—be born again to see (v. 3) and to enter (v. 5). ❖ In John 3:5 we are born of water (terminating our old life) and the Spirit (generating our new life). In Galatians 2:20 “it is no longer I who live”—my old life, “but it is Christ who lives in me”—my new life. The more Christ lives in us the more we see and enter New Jerusalem. 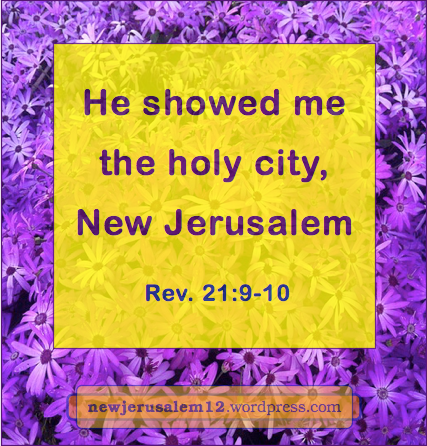 In Revelation 21:9-10 John tells us that an angel carried him away in spirit to a great and high mountain and showed him the holy city, New Jerusalem. This clearly was not John’s effort. Likewise, our seeing of New Jerusalem is not by our determination nor by our striving. We simply turn to the Lord, open our whole heart to Him, and wait on Him. In His time He will give us the vision of New Jerusalem.